Faerie Queene research papers discuss Edmund Spenser's classic story of the Redcrosse Knight. 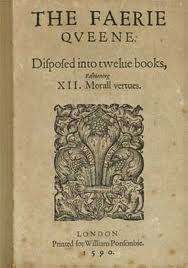 Edmund Spenser’s The Faerie Queene is an allegorical tale of private and public virtue. In it, the travels and tests of the Redcrosse Knight present an instructional and cautionary tale to its seventeenth century British audience. The treatment of love and desire in The Faerie Queene is a function of a strict code of morals that the Redcrosse knight embodies, and is very different from the way that love and desire are thought of today. The ideas of pleasure and desire are dealt with mostly in the first half of The Faerie Queene, as that is the part that deals with the ideals of virtue in private life. The character of Una embodies the virtue of holiness. he faerie queene is the very picture of truth and purity, and the love between her and the Redcrosse Knight is put forth as the ideal love. Spenser’s The Faerie Queene treats desire and pleasure with respect to physical love as dangerous, but natural. The very concept of virtue includes the idea of an ideal that is not easily achieved. One must strive towards such ideals against humanity’s baser nature to achieve a higher state. There is a constant struggle between the worldly and the divine parts of human nature. In the world of the Redcrosse Knight, pleasure is a temptation that must be resisted to achieve holiness. In The Faerie Queene, desire and pleasure are dangerous obstacles to holiness and their chief benefit is in the fact that they test the hero’s strength. True love is set up as an ideal, however, basic physical desire is not its primary characteristic. There are many images within this scene that could be interpreted sacramentally. Many scholars are not convinced that the tree of life’s fruit is supposed to represent Christ’s body, but it certainly would leave one to believe that it does. The trickling flow of “Balme” that runs down the tree leads one to think of Christ’s blood. The faith of Redcrosse has been nourished in some very important way by the sacramental rite of communion. The sacramental rite of communion is the primary function of which one is to take the promise of Christ by partaking in the fact that his flesh is food and his blood is drink that allows one to sustain life. On the whole, however, the episode does resist attempts for one to construe it as participation in an actual sacramental rite and discourages efforts for one to read Redcrosse’s last victory as being dependent on a literal eating and drinking of Christ’s sacramental blood and body. It is, however, an interesting metaphor for the reader’s mind to engage. Overall, one can see that The Faerie Queen addresses many issues of a religious nature. It is also apparent that Spenser, being a religious man himself, had many messages of faith that he wished to impart on the rest of the world through his writing. The Faerie Queen gets so heavily into religious allusions and metaphors that one can see Spenser intended the story to be inspirational. Book 1 of The Faerie Queen with its broad structural outline and also in the way the individual episodes are managed is a classic example of Protestant biblical rhetoric just as Luther described it. During the first nine cantos, Redcrosse is brought to an increasing feeling of knowledge of his sinfulness, and this movement comes to a head during the Despaire scene in the discovery that he is guilty before the law. Having realized through experience the innate depravity of the human will, his faith in God’s mercy is aroused by the words of promise. These words are spoken first in canto 9 by Una and then repeated and even amplified in canto 10 by Fidelia, Speranza, Patience and Contemplation. Redcrosse is then led down into Orgoglio’s hell in canto 8, and then in canto 10 he is exalted by a vision of his place that he is destined to go to in the New Jerusalem. Within these individual episodes one begins to see a pattern that even continues over the long haul and that is the pattern of falling and then rising, facing the law and the gospel and also God’s threats and God’s promises. One can take another example. In Redcrosse’s opening battle with Errour, the monstrous nature of Errour being half woman and half serpent carries with it an allusion to the temptation of Genesis 3 and to the doctrine, therefore, of original sin. As Spenser handles this episode one can see that the battle itself dramatizes this doctrine of justification by faith and faith alone. Una advises him to have faith and to not be weak and this momentarily arouses the knight, but more as a surge of power than faith. Further, this surge of force seems to help him at first but it very quickly becomes less than useless as Errour vomits and chokes the knight. The narrative establishes that it is futile to try and overcome Errour (to achieve saving faith) through even the best efforts of human will. It is the close of stanza 22 that the tide of the battle begins to turn in Redcrosse’s favor and it does this through a reference to Revelation 9:4, where it is promised by John that the stings of the locusts should hurt only those men who have not been touched by God. It is also notable that Redcrosse has a work ethic that without God’s help is futile. This relates closely to how Spenser felt about his own work ethic and it’s futility without God. The Gospels - The Gospels research papers report that the Gospels are the teachings of Jesus Christ and the history of his life. Original Sin - Original Sin Research Papers delve into the Catholic definition of this term, and how it effects all the descendants of Adam and Eve. Chivalry - Your Chivalry literature research paper could discuss Knights in shining armor, damsels in distress, and fair play all often come to mind. The Gospel of John Research Papers look at a sample of an order placed for a paper on the book of john and Yahweh's efforts to establish his people. The Knight's Tale - The Knight's Tale Research Papers discuss different elements of courtly love in one of Chaucer's Canterbury Tales. Order a research paper on The Knight's Tale from Paper Masters. Sir Gawain and the Green Knight - Sir Gawain and the Green Knight research papers explore chivalry in the great work of medieval literature from the point of view of society, women and Sir Gawain himself. Sir Gawain - Paper Masters shows you how to write a Sir Gawain Research Paper by using the treatment of the heroic ideal in the epic English poem, Sir Gawain and the Green Knight, which was written in the latter part of the fourteenth century. Sir Gawain and the Green Knight - Sir Gawain and the Green Knight research papers in the English Literature story. English essays for sale and custom written from Paper Masters. Definition of Humanities - Definition of Humanities discuss the different approaches to defining exactly what 'humanities' is. Paper Masters writes custom research papers on Faerie Queene and discuss Edmund Spenser's classic story of the Redcrosse Knight.